A popular dish that is an on trend must have. Cut the cabbage into half. Dissolve salt (300g) in 2litres water. Soak the cabbage in the salt water for 24 hours, covered and room temperature. Drain the cabbage in a large bowl, squeezing as much water from the leaves as possible. Cut the following into 4cm pieces: Korean mustard leaves, parsley and spring onions. Pour water and salted anchovy in a pot and boil. Put the broth through a sieve to sift out the lumps. Let it cool. Add the chilli pepper to the broth. Combine the finely diced garlic, finely diced ginger, and salted shrimp. Mix well. Combine the seasoning with the prepared radish and toss to coat well. Add Parsley, spring onions, Korean mustard leaves and leek, mix gently. Add salt and sugar and mix well. Pack tightly into large sterilised glass jars. Seal with their lids. Allow to ferment for a further 24 hours in a cool dark place. Open lids to release any ferment gas. Reseal and store in the walk in for at least 48 hours before eating. 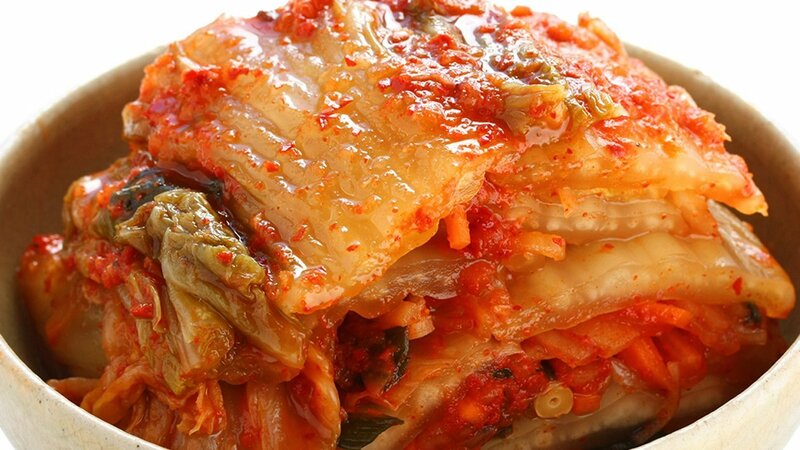 Ideally allow to ferment for a week before serving. Store in the walk in and eat within 3 weeks.